Preorder now here or from your favorite retailer! You remember that defiant cry from childhood: “You’re not the boss of me!” Well, a question we should ask ourselves in adulthood is, who is the boss of me? Whether or not you work for yourself, a small company, or a huge corporation, we’re in an era of disruption and psychological self-employment. We all have to think about retraining ourselves in case our jobs or industries change radically, and advocate for our own long-term economic health. My political reporting during the Great Recession led me back to the topic of jobs again and again. I wanted to understand how Americans re-envisioned and rebuilt their work and financial lives during this era. The great recession is technically over, but the period of intense disruption and creation in the world of jobs and careers will go on for the foreseeable future. The question is: how do you prepare, respond, evolve? In The Episodic Career I use in-depth storytelling and analysis to explore themes of personal resilience and how, no matter what kind of work we do, we can find new paths in a world of technological and economic change. How is work in America changing, and how can you navigate today’s volatile job market? 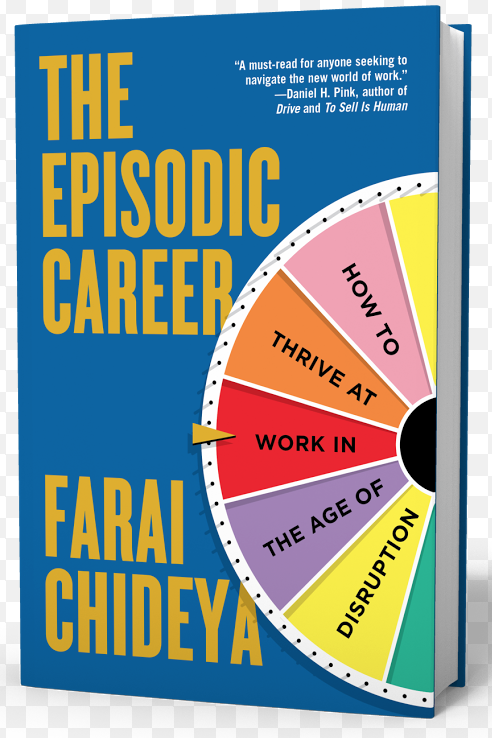 Award-winning author, researcher, and analyst Farai Chideya offers a practical guide to finding your most rewarding place in today’s economy. Since the Great Recession of 2007–2009, America’s work landscape has changed dramatically. Many people experienced long-term unemployment that eroded their savings. The globalized economy means that not just jobs but entire career tracks are created and destroyed in front of our eyes. We’re living in an age of rapid disruption. We can barely adjust to one new reality before a new new reality comes along. So how are we supposed to live a rewarding life—working fulfilling, stable jobs pay the bills and for retirement—in such a chaotic economy? You’ll see how different types of people have navigated their careers and forged their own paths, even in times of hardship. Emotional resilience is one of the most critical skills you can cultivate and learn, and dozens of in-depth stories will illustrate the ways hard decisions can ultimately lead to career growth. As a young black American reporters at Newsweek, CNN, and ABC, Chideya saw how race, gender, and even factors like Ivy League education affected perceptions of her and other employees; and in The Episodic Career takes a frank look at stereotypes and employment discrimination. Ultimately, she asks how we as a country can sustain the American Dream. Knowledge of the workplace is power over your career. The Episodic Career provides the big-picture vision of the world economy, as well as the particulars of salary, family, health, and lifestyle that you need to thrive in a rapidly changing world. Kiss The Sky tracks the life of Sophie “Sky” Lee, a thirtysomething black rock musician making a comeback in New York City in 2000. There are a few hitches to her plans: Sky’s guitarist is her mercurial, drug-abusing ex-husband; her manager is also her boyfriend; and Sky herself is frightened of the cost she’ll pay to reach the pinnacle of fame. Add to that her struggles with religion, her family, and her meddling girlfriends and you have a book which blends substantial themes of love, faith, and longing with contemporary pop culture. 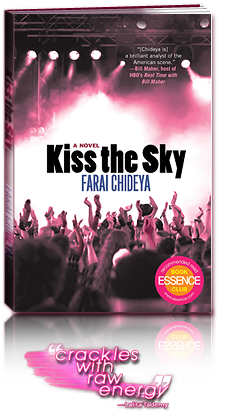 Kiss the Sky also has a catalogue of music references on par with books like High Fidelity. Stay tuned here to learn more about the Kiss the Sky book tour coming to a city near you. Please check out the events page for my ongoing tour dates. Trust, Soft Skull, 2004 In these provocative pieces, Farai Chideya looks at and beyond the daily political struggles to the heart of a nation at war with itself. The 2000 election highlighted the rift between liberal/conservative and Red State/Blue State. But that superficial crack, says Chideya, indicates much more serious, indeed foundational, damage. The United States, she argues, lacks the moral, legal, and psychological framework for debating complex issues in a pluralistic society, relying instead on an outdated dichotomy model that says each issue has two opposing sides instead of many interested parties. To buy multiple copies of Trust at a discount for nonprofits and educational institutions, email booksales@farai.net. To buy multiple copies of the hardcover of The Color of Our Future at a discount (less than the price of the paperback) for nonprofits and educational institutions, email booksales@farai.net. Don’t Believe the Hype: Fighting Cultural Misinformation About African Americans, Plume, 1995 The stated purpose of Chideya’s book is to “give readers a chance to question the depictions of race that have become standard in newspapers and on the nightly news, a map through the modern realities and misconceptions about race.” She succeeds in 18 chapters, each of which discusses an issue, then examines the reality behind frequently asked questions and frequently held myths. 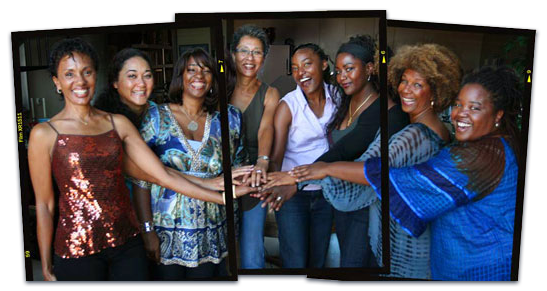 Farai couldn’t have made her lifelong dream of being a novelist happen without the women known as The Finish Party. The Finish Party is a group of eight fine, feisty, female authors from Northern and Southern California. Their monthly meetings offer each writer a powerful way to critique their work-in-progress; share triumphs; support one another through hardships; laugh, eat great food; and of course finish their novels! The Finish Party was profiled in the October 2007 issue of O Magazine. The other “Finish Partiers” are Deborah Santana (Space Between the Stars); Alyss Dixson; Nichelle D. Tramble (The Dying Ground); Lalita Tademy (Red River); Renee Swindle (Please, Please, Please); ZZ Packer (Drinking Coffee Elsewhere); and Jacqueline Luckett (Searching for Tina Turner). Find out more about the Finish Party’s latest adventures here.